An Open Forum on Ago-Chemicals was held on July 7, 2011 at the Hector Kobbekaduwa Agriculture Research and Training Institute, Wijerama Mawatha, Colombo 7 with the participation of over 200 people representing farmers, Trade unions, civil society organizations, academics and researches. 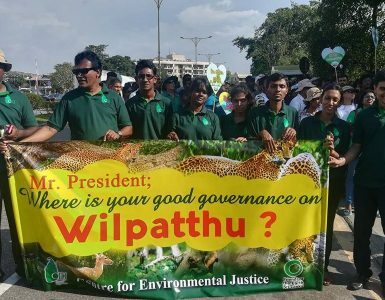 This was organized by Vikalpanie Centre for Environmental Justice, Monlar, Sri Lanka Soba Samuhikaya, New Era, Swarnahansa Padanama, and the Buddhist Actions on Nature and other Civil Society organizations. A team of researchers from the Kelaniya and Rajarata Universities found that high levels of Arsenic in number of pesticides. They claim that Chronic Kidney Disease found in Rajarata is due to Calcium Arsenate as a result of these pesticides. However, researchers in University of Peradeniya says that the kidney failure is due to high levels of Cadmium in Fertilizer. Campaign against Pesticides is older than 3 decades. Pesticides was radically introduced in late 60s under the so called Green revolution. By 1980s people found that these chemicals have many negative impacts. Some were banned. But many poisonous agrochemicals still being used. While the main ingredients itself are very harmful to people, other living beings and the ecosystems, some heavy metals in the pesticides are also highly poisonous. Arsenic, Mercury,Cadmium are some of them. Chronic Kidney Disease originally found in Rajarata is still an unidentified disease. More than 20,000 people have already died form this disease and another 20,000 people are dying. Although it was originally said that males over 40 years subject to this, now found some children of 8 years also suffering from the same. Unfortunately all authorities including the World Health Health Organization have so far failed to identify this disease. Some researchers say this is due to the high levels of Cadmium in water. So say it is due to the High Fluoride in water. Another set of researchers say it is due to a Cynotoxin comes form an Algae. Most recent research says it is due to the high levels of Arsenic in number of pesticides. This has been subjected to strong debate.